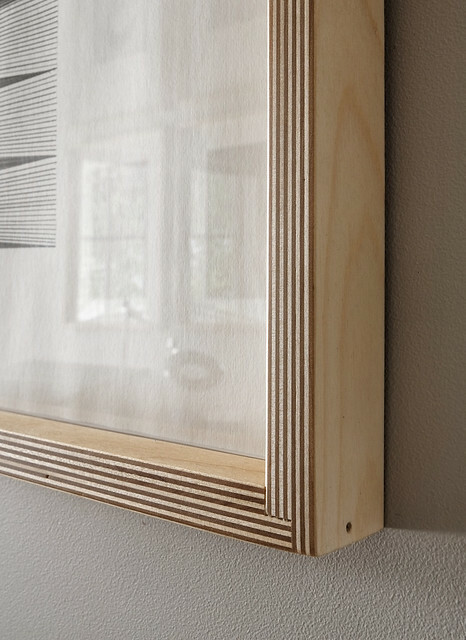 The frames are made from sheets of 13 ply (18mm or 3/4" thick) baltic birch plywood - cut, assembled, sanded and finished with bee's wax/mineral oil paste, the same paste you might use on your wood cutting boards or butcher block countertops, or tung oil. I assemble the frames using a simple rabbet joint with glue and a small brad - on larger framed work I add metal corner braces to the inside back face to reinforce the corners. The rabbet joint is left exposed as a simple detail that is quite handsome with the exposed ply's meeting in the corner. It is a very durable corner joint... The edge of the ply's form the face of the frame and bring a natural, varied and interesting linear quality to the overall work. After frames are made, I then prepare the artwork for framing (each art piece is signed, titled, and dated on the back in pencil) and mounted to archival natural white rag board with small double sided archival mounting tape. 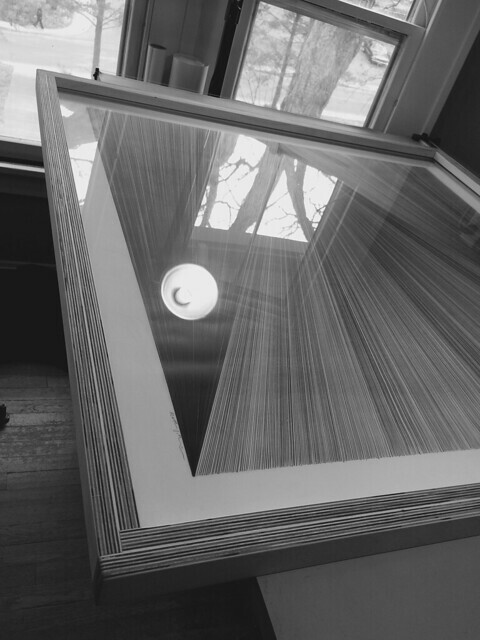 Next, I cut and place double thickness archival mat board to space the artwork from the glazing or use a float "frame spacer" to hold the glazing away from the drawing surface. 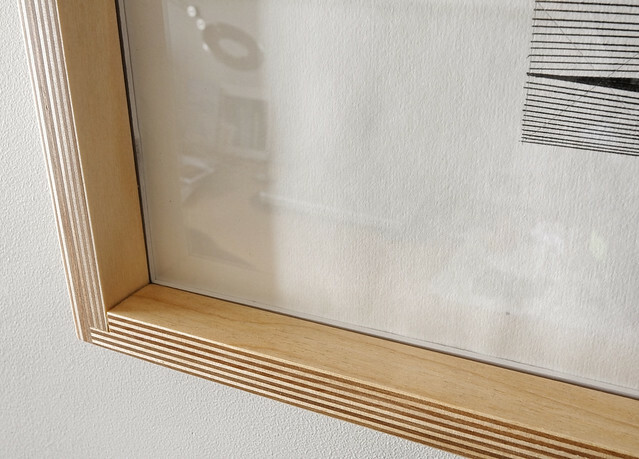 The mat or frame spacer is the same width as the frame inset (for drawings) so as to not be visible as a mat, simply as a spacer between the artwork and the glazing face. Finally, I place the protective glazing sheet in the finished frame. I use a museum grade, clear acrylic sheet generally rather than glass for less weight and for overall durability. A side note; acrylic is tough, but can scratch - so care must be taken when cleaning the surface, only use cleaner that is specifically meant for care of acrylic, readily available at most art / framing shops. With acrylic glazing placed in the frame, I then place the spacer mat around the edges, check for dust / lint and lastly, place artwork mounted on rag backing board. 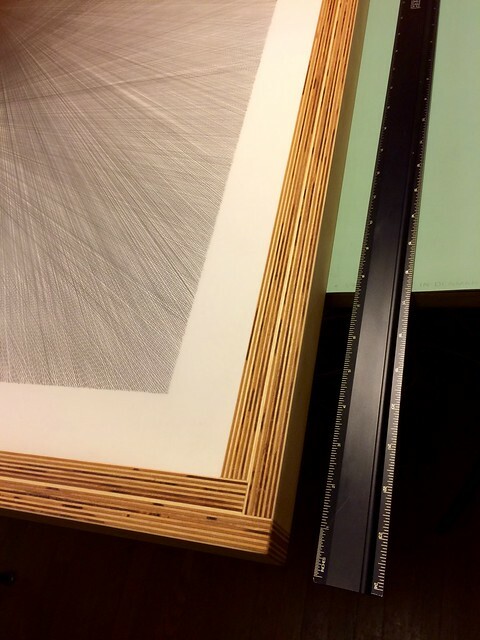 The whole assembly is then secured with picture framing points and the piece is sealed from dust with archival framing tape. Once complete, I use picture hanging wire to ready the piece for hanging and affix a label onto the back as a record of the piece, including name, date, medium and my contact information. I hope this helps answer a few questions you may have about my work offered here as "custom framed works". Please feel free to email me niebuhr.matt[at]gmail.com if you have any questions! I want you to fully enjoy your purchase and to consider yourself a collector. Your support allows me to make work, I really appreciate your patronage. 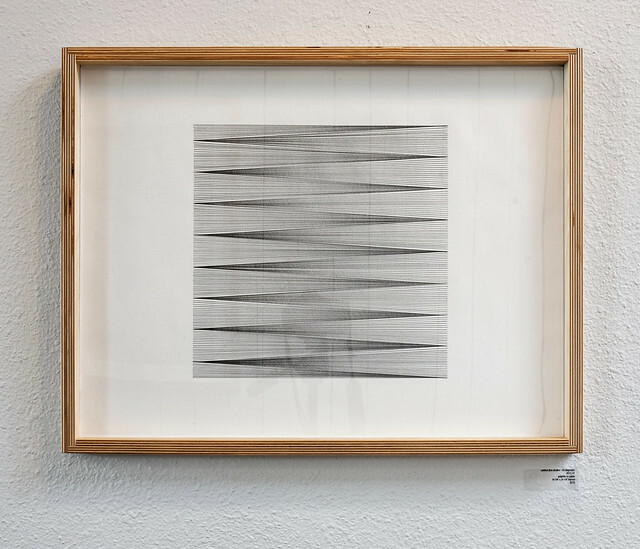 Matt Niebuhr is an artist living and working in Des Moines, Iowa.